In family law, there are agreements and there are agreements. Some are merely recommendations to the court, while others are binding on the parties. The distinction is exemplified in three relatively recent court of appeals decisions. First, a little background. Wis. Stat. §767.255(3)(L), provides that “any written agreement between parties to a family law action shall be binding upon the court unless it is inequitable.” (Emphasis added) However, the court is required to presume that such an agreement is equitable. On the other hand, Wisconsin courts have long held that a stipulation between the parties in a divorce action is a “recommendation jointly made by them to the court suggesting what the judgement, if granted, is to provide. In Wisconsin it is not required that the family court accept or reject the stipulation in toto….” Bliwas v. Bliwas, 47 Wis. 2d 635, 638-9, 178 N.W.2d 35 (1970). Therefore, either party can repudiate the stipulation prior to trial. Norman v. Norman, 117 Wis. 2d 80, 342 N.W.2d 780 (Ct. App. 1983). The distinction lies in the fact that the agreements considered by the above cases assumed the end of the marriage, whereas agreements contemplated by Wis. Stat. §767.255(3)(L) presume the continuity of the marriage. 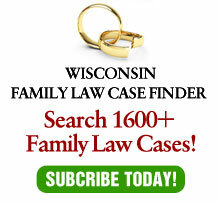 This has created some problems, as Wisconsin law also requires, absent some major emergency, the passage of at least 120 days from service of the summons to when a divorce can be granted. Wis. Stats. §767.083. It is during this waiting period that some parties wish to finalize their agreement. This desire to finalize is especially strong for custody and placement issues, as without finalization, trials can be adjourned as placement issues arise last minute. Even worse, failure to “nail down” a custody/placement arrangement can cause the children to be bargaining chips in the financial negotiations. The court upheld a means for finalizing custody and placement arrangements in Keller v. Keller, 214 Wis. 2d 32, 571 N.W.2d 182 2, (Ct. App. 1997). In that case, the parties entered a stipulation during the pendency of the divorce regarding legal custody and physical placement of the minor children. The stipulation was approved by the court. Prior to trial, the wife requested a case study regarding the placement arrangement. The circuit court denied the request on the grounds that the stipulation had concluded the issues with finality. The ruling was upheld on appeal. The appellate court recognized that interlocutory agreements can usually be disavowed and the issues re-litigated. However, the stipulation in this case was intended to reflect the final resolution of the issues. More recently, however, in Evenson v. Evenson, No. 98-0803 (Wis. Ct. App. June 9, 1999 )(ordered published July 21, 1999), the court of appeals reversed a trial court for holding the husband to an agreement signed during the pendency of the divorce. To facilitate the purchase of a house by the husband shortly after the action was commenced, the parties entered into a “Limited Marital Property Agreement.” The agreement used the caption and case number of the divorce action, but was not approved by the court. By the time of the divorce, the husband wanted out of the agreement and the wife wanted to enforce it. The appellate court held that the case was controlled by Ray v. Ray, 57 Wis. 2d 77, 203 N.W. 2d 724 (1973). In Ray, the court drew a distinction between agreements which contemplate a continuation of the marital relationship, which are reviewed only for fraud, and those agreements which are made in contemplation of divorce which require court approval. Since the agreement in Evenson was a divorce stipulation, the husband was free to repudiate all or part of it up to the time it is approved by the court. Even more recently, in Ayres v. Ayres, No. 98-3450 (Wis. Ct. App. Sept. 8, 1999)(recommended for publication), prior to either party filing for divorce, the parties executed an agreement for the stated purpose of a divorce, although the agreement stated that it was a binding contract. Five days after it was signed, the wife filed for divorce. The husband sought to withdraw from the agreement. The wife claimed that the agreement was subject to Wis. Stat. §767.255(3). The court of appeals analyzed the agreement pursuant to Ray, supra, holding that the postnuptial agreements are treated differently from agreement executed for the purpose of facilitating divorce. The court further held that the contractual language does not “allow a party to circumvent the court’s third-party responsibilities and contravene legislative intent.” Therefore, the agreement falls under Wis. Stat. §767.10 and is subject to the approval of the court. Surprisingly, the appellate court in Ayres does not cite its own decision in Evenson. Even more surprisingly, neither Ayres nor Evenson make any reference to Keller. Nevertheless, distinctions can be drawn between the cases which would explain the holdings. An agreement which contemplates the marriage continuing will be subject to different standards than an agreement which contemplates the end of the marriage. In the former instance, the agreement is presumed equitable and neither party can unilaterally abrogate it. In the latter instance, either party can abrogate the agreement prior to its acceptance by the court. It is not necessary, however, for the parties to wait until the final divorce to have the court approve the agreement. By submitting the agreement to the court for entry as an order, in essence the parties are affording the “third party” review required of a divorce settlement agreement, even though there may be other issues still to be decided. The enforceability of pre-divorce agreements is important. As Wisconsin law requires the valuation of assets as of the date of the divorce, there is little incentive for either party to behave in a fiduciarily responsible manner. Indeed, often the system actually rewards irresponsibility and punishes responsibility. For example, a party who incurs debt during the pendency of an action may exhibit a higher standard of living, thus increasing support. To the contrary, a party who lives within his or her means and actually saves money (a foreign concept to most divorcing parties) not only shares the savings with the other party, but may have exhibited an ability to live on less income. Not all of this, of course, can be corrected by submitted interim orders for approval by the court. However, the enforceability of such orders may avoid this perverse reward/punishment scenario and prevent much of the fear of the unknown which pervades most participants in the process. Most important, by allowing early resolution, the parties can safely plan for their future, while avoid acrimony which severely taints their relationship with the future ex-spouse.